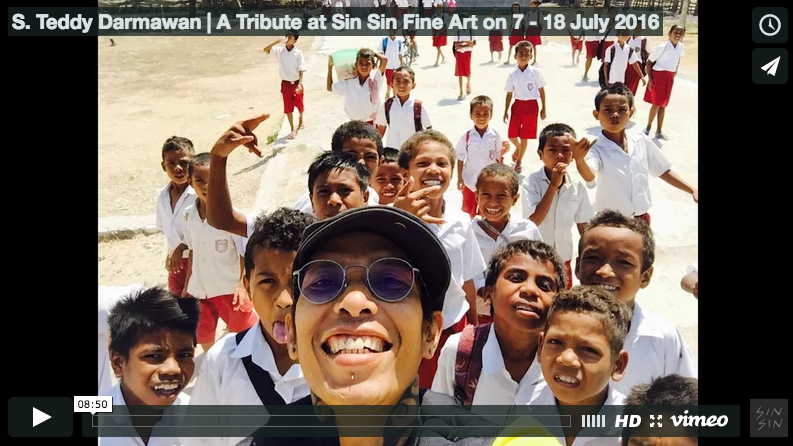 We gathered at Sin Sin Fine Art on 7th July to convey our love and pray for our beloved S. Teddy Darmawan (1970 - 2016), to find the continuous journey to eternity. Thank you for coming to celebrate the beautiful life with us. The exhibition continues until 18th July 2016. Here are some precious memories we shared together through the years. We will present a tribute exhibition for Sosok Teddy Darmawan (1970 – 2016), honouring both a friendship and his incredible work. As one of the leading contemporary Indonesian artists, he was known for his energetic, self-expressive works that often used humour to provoke a greater dialogue surrounding the deep-rooted social and historical issues of Indonesia. In memory of S. Teddy Darmawan, we are inviting everyone to get together with us and celebrate Teddy's inspiring life. Sin Sin Fine Art associated with "Le French May" proudly presents a solo exhibition by French Artist Vincent Cazeneuve (Wensen Qi) who has been living in China for 9 years. In this exhibition shows Vincent’s last researches about bodiless lacquer which enables the artist to explore further - not only apply lacquer on wood, but also on fibers, fabric and bamboo. He reconnected with this ancient technique used especially for statues in the Buddhist art in Asia. Grab the last chance to have a look at the artworks this week. 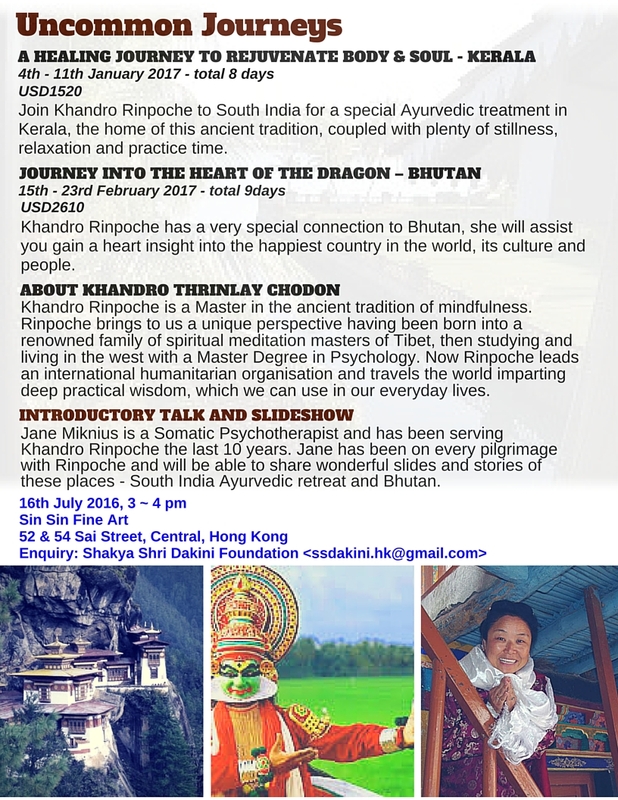 Khandro Rinpoche brings to us a unique perspective – having been born into a renowned family of spiritual meditation masters of Tibet, then studying and living in the west with a Master Degree in Psychology. Now Rinpoche travels the world imparting deep practical wisdom, which we can use in our everyday life. Jane Miknius has been serving Khandro Rinpoche for the last 10 years. Jane will be sharing wonderful slides and stories of these journeys with us. Artist Talk: Why Shenzhen ? This Summer, Sin Sin Fine Art proudly presents a refreshing group exhibition “Assembling” to bring together 5 artists with different cultural backgrounds who all based in Shenzhen, China. Sin Sin Fine Art proudly presents the first solo exhibition in Asia Pacific of renowned Cuban artist Carlos García de la Nuez. He emerges in the so-called generation of the eighties, marked by a break with the traditional school of Cuban painting. He was part of 4X4 Group, of vital importance in the plastic arts during that time. Its aesthetics, based on the expressionist gestural language, with influences of the abstract art, dignifies the national art. Stains, textures and signs of a subtle masterpiece, retailer, whose effective element of tension and balance, they enhance a whole lyric of subjective concepts and undoubted artistic vigor. Tisna Sanjaya performs at the Graben, Centrum, centre city of Vienna Austria. The theme is "Peace, picking the blessing, Ngabuburit on Ramadan in Vienna”. Tisna Sanjaya is a Moslem and he is fasting for a month during Ramadan month. In the Moslem tradition, people use the time before sunset (ngabuburit) for meaningful activities to get though the fasting time easier. In this show Tisna Sanjaya show his artwork with Popo Iskandar, Nasirun and Zico Albaiquni, son of Tisna. In this exhibition the artists go into dialogue with each other and show a tangible reflection in the sphere of Indian summers. In words and pictures from July 9, there are several artists present for the Symposium 2016. Participating artists include Kartika Affandi and Eddi Prabandono from Indonesia - known for its beautiful installation at the Venice Biennale in 2015, Kouji Ohno and Toshitaka Nishizawa of Japan, Roel Teeuwen Els Otten and Simone Ten Bosch from the Netherlands and Sarantis Gagas from Greece. They will be at Land Art Delft for two weeks long invited to work on their art. When the works are completed, they will included in Land Art Delft collection. The collection now contains seventy artworks which a large number of works by Joost Barbiers. As co-organizer of "Weltreporter Forum" Roland Hagenberg invites you to join on July 23 at the Franz Liszt Concert Hall in Raiding (birthplace of the Austrian composer). As the biggest independent German speaking foreign correspondent network together with renowned representatives of the media, there will be discussion on current global developments and how they affect Europe. The 38th annual Bali art Festival officially opened by Indonesian President Mr. Joko Widodo in Puputan Renon, Denpasar. This year theme is “karang Awak” meaning love the homeland. Every day there are three to four art performances from each district in Bali. One of the abroad participant is a puppet theatre group Les Grandes Personnes (Giant Scarecrow), this group formed in 1998 in Aubervilliers, a suburb of Paris. Many provinces from Indonesia also take place on this event.